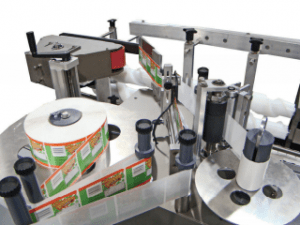 The labeler model 1000 VGF is a fully automatic model designed for the accurate placement of long, wrap-around labels on round tapered containers or three sides of a rectangular container. This is accomplished with the use of two vacuum gates. The label is dispensed across the conveyor and held in place by the vacuum gates. The container travels down the conveyor and makes contact with the extended label. The vacuum gates serve to wipe the label as they open to allow the container to continue down the conveyor. Brushes complete the wipe-down process. Consistent, precise labeler application is controlled through the use of a PLC with photo eye detection of the container and label. The inclusion of stepper motors provides faster and even more accurate label application. Versatile, easy to operate, and economical, the 1000VGF provides an excellent labeling solution for a difficult application. Label 1” to 5” diameter containers. Apply labels from 1” to 4 ½” tall and 10” long. Label can be moved up to 8” from base of container. Accepts random or continuous bottle feed. Changeovers require no tools and take less than 10 minutes. Spacing Wheel standard with machine. Labeling speeds to 80 containers per minute. Accepts industry standard 3” diameter core. Maximum label roll size of 12”. Photo eye product detection and photo eye gap detection. Hot Stamp coding for lot/date information. The labeler model 1000 Feed Screw is fully automatic, designed for high speed labeling on round bottles where precise spacing is required. Consistent, precise label application is controlled through the use of the feed screw that orients the bottle as well as photoeye detection, photoeye gap detection and a state-of-the art PLC. 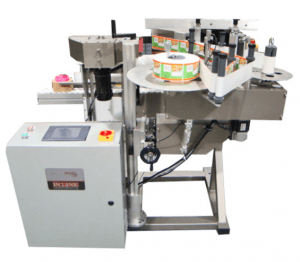 With available options, the 1000 FS can be configured to label tapered containers, gallon containers, apply label coding, or place a full wrap label on a square bottle. The inclusion of stepper or servo motors provides faster and even more accurate label application. Versatile, easy to operate, and economical, the model 1000 provides an excellent entry level labeling solution for food and beverage, nutritional, household, and chemical packagers! 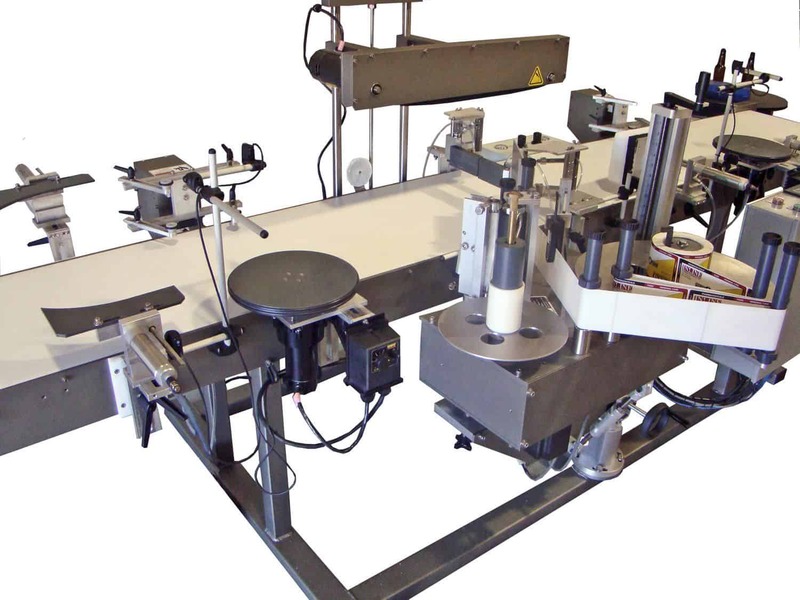 The model 1000SS Redundant-head Labeler is a fully automatic labeler designed for high speed labeling on round bottles without losing downtime for label roll changeovers. The machine detects when the end of roll is reached and automatically changes over to the other applicator without missing any containers within the machine. When the first roll is replaced, the machine will then change back to it as the other roll ends. In this way there is no downtime for label roll changeovers! The standard machine is rated to 150 bpm for an 8” long label, and with the servo option up to 250 bpm. 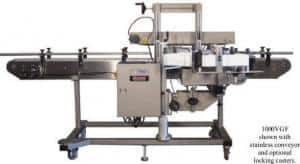 Other options include hot-stamp coding, top belt for bottle stability, tall or extra tall labels, and custom spacing belt to replace the feedscrew infeed for universal bottle spacing. situations where downtime from label changeover needs to be reduced and/or eliminated. Label 1” to 6” diameter containers. Apply labels from 1” to 4 ½” tall and 14” long. Label can be moved up to 5” from base of container. Single feedscrew is standard with machine. Labeling speeds to 150 containers per minute. Maximum label roll size of 16”. Photoeye product detection and photoeye gap detection. Stepper-driven label applicator with speeds to 1500 ipm. Extra Tall Label Kit for labels up to 7 ½” tall. 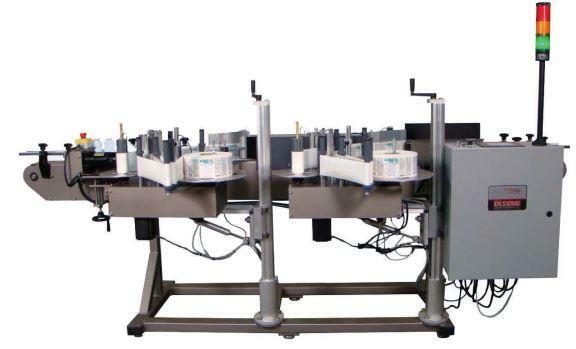 Servo-driven labeling applicators for higher speeds. Top belt for bottle stability.